For other uses, see Flax (disambiguation). 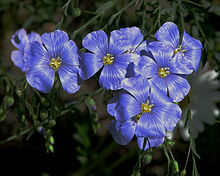 Flax (Linum usitatissimum), also known as common flax or linseed, is a member of the genus Linum in the family Linaceae. It is a food and fiber crop cultivated in cooler regions of the world. 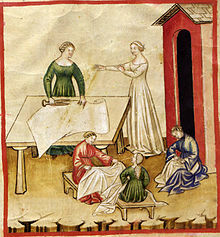 The textiles made from flax are known in the Western countries as linen, and traditionally used for bed sheets, underclothes, and table linen. The oil is known as linseed oil. In addition to referring to the plant itself, the word "flax" may refer to the unspun fibers of the flax plant. 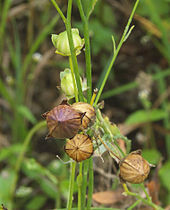 The plant species is known only as a cultivated plant, and appears to have been domesticated just once from the wild species Linum bienne, called pale flax. Several other species in the genus Linum are similar in appearance to L. usitatissimum, cultivated flax, including some that have similar blue flowers, and others with white, yellow, or red flowers. Some of these are perennial plants, unlike L. usitatissimum, which is an annual plant. Cultivated flax plants grow to 1.2 m (3 ft 11 in) tall, with slender stems. The leaves are glaucous green, slender lanceolate, 20–40 mm long, and 3 mm broad. The flowers are pure pale blue, 15–25 mm in diameter, with five petals. The fruit is a round, dry capsule 5–9 mm in diameter, containing several glossy brown seeds shaped like an apple pip, 4–7 mm long. The earliest evidence of humans using wild flax as a textile comes from the present-day Republic of Georgia, where spun, dyed, and knotted wild flax fibers were found in Dzudzuana Cave and dated to the Upper Paleolithic, 30,000 years ago. Flax was first domesticated in the Fertile Crescent region. Evidence exists of a domesticated oilseed flax with increased seed size by 9,000 years ago from Tell Ramad in Syria. Use of the crop steadily spread, reaching as far as Switzerland and Germany by 5,000 years ago. In China and India, domesticated flax was cultivated also at least 5,000 years ago. Flax was cultivated extensively in ancient Egypt, where the temple walls had paintings of flowering flax, and mummies were entombed in linen. Egyptian priests wore only linen, as flax was considered a symbol of purity. Phoenicians traded Egyptian linen throughout the Mediterranean and the Romans used it for their sails. As the Roman Empire declined, so did flax production, but Charlemagne revived the crop in the eighth century CE with laws designed to publicize the hygiene of linen textiles and the health of linseed oil. Eventually, Flanders became the major center of the linen industry in the European Middle Ages. In North America, flax was introduced by the colonists and it flourished there, but by the early 20th century, cheap cotton and rising farm wages had caused production of flax to become concentrated in northern Russia, which came to provide 90% of the world's output. Since then, flax has lost its importance as a commercial crop, due to the easy availability of more durable fibres. Flax is grown for its seeds, which can be ground into a meal or turned into linseed oil, a product used as a nutritional supplement and as an ingredient in many wood-finishing products. Flax is also grown as an ornamental plant in gardens. 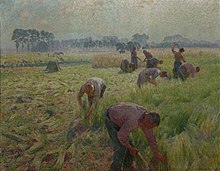 Moreover, flax fibers are used to make linen. The specific epithet, usitatissimum, means "most useful". 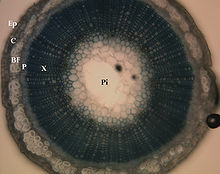 Flax fibers taken from the stem of the plant are two to three times as strong as cotton fibers. Additionally, flax fibers are naturally smooth and straight. Europe and North America both depended on flax for plant-based cloth until the 19th century, when cotton overtook flax as the most common plant for making rag-based paper. Flax is grown on the Canadian prairies for linseed oil, which is used as a drying oil in paints and varnishes and in products such as linoleum and printing inks. Linseed meal, the byproduct of producing linseed oil from flax seeds, is used to feed livestock. It is a protein-rich feed for ruminants, rabbits, and fish. Flaxseeds occur in two basic varieties/colors: brown or yellow (golden linseeds). Most types of these basic varieties have similar nutritional characteristics and equal numbers of short-chain omega-3 fatty acids. 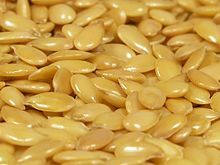 The exception is a type of yellow flax called solin (trade name "Linola"), which has a completely different oil profile and is very low in omega-3s. Flaxseeds produce a vegetable oil known as flaxseed oil or linseed oil, which is one of the oldest commercial oils. It is an edible oil obtained by expeller pressing and sometimes followed by solvent extraction. Solvent-processed flaxseed oil has been used for many centuries as a drying oil in painting and varnishing. Although brown flaxseed varieties may be consumed as readily as the yellow ones, and have been for thousands of years, its better-known uses are in paints, for fiber, and for cattle feed. A 100-gram portion of ground flaxseed supplies about 534 calories (2,230 kJ), 41 g of fat, 28 g of fiber, and 20 g of protein. Flaxseed sprouts are edible and have a slightly spicy flavor profile. Excessive consumption of flaxseeds with inadequate amounts of water may cause bowel obstruction. In northern India, flaxseed, called tisi or alsi, is traditionally roasted, powdered, and eaten with boiled rice, a little water, and a little salt. In India, linseed oil is known as alsi in Hindi and javas in Marathi. It is mainly used in Savji curries, such as mutton (goat meat) curries. Whole flaxseeds are chemically stable, but ground flaxseed meal, because of oxidation, may go rancid when left exposed to air at room temperature in as little as one week. Refrigeration and storage in sealed containers will keep ground flaxseed meal for a longer period before it turns rancid. Under conditions similar to those found in commercial bakeries, trained sensory panelists could not detect differences between bread made with freshly ground flaxseed and bread made with flaxseed that had been milled four months earlier and stored at room temperature. This shows, if packed immediately without exposure to air and light, milled flaxseed is stable against excessive oxidation when stored for nine months at room temperature, and under warehouse conditions, for 20 months at ambient temperatures. Three natural phenolic glucosides—secoisolariciresinol diglucoside, p-coumaric acid glucoside, and ferulic acid glucoside—can be found in commercial breads containing flaxseed. Flax fiber is extracted from the bast beneath the surface of the stem of the flax plant. Flax fiber is soft, lustrous, and flexible; bundles of fiber have the appearance of blonde hair, hence the description "flaxen" hair. It is stronger than cotton fiber, but less elastic. The best grades are used for fabrics such as damasks, lace, and sheeting. Coarser grades are used for the manufacturing of twine and rope, and historically, for canvas and webbing equipment. Flax fiber is a raw material used in the high-quality paper industry for the use of printed banknotes, laboratory paper (blotting and filter), rolling paper for cigarettes, and tea bags. The use of flax fibers dates back tens of thousands of years; linen, a refined textile made from flax fibers, was worn widely by Sumerian priests more than 4,000 years ago. Industrial-scale flax fiber processing existed in antiquity. A Bronze Age factory dedicated to flax processing was discovered in Euonymeia. Flax mills for spinning flaxen yarn were invented by John Kendrew and Thomas Porthouse of Darlington, England, in 1787. New methods of processing flax have led to renewed interest in the use of flax as an industrial fiber. In a 100-gram serving, flaxseed contains high levels (> 19% of the Daily Value, DV) of protein, dietary fiber, several B vitamins, and dietary minerals. Ten grams of flaxseed contains one gram of water-soluble fiber (which lowers blood cholesterol) and three grams of insoluble fiber (which helps prevent constipation). Flax contains hundreds of times more lignans than other plant foods. Flaxseeds are especially rich in thiamine, magnesium, potassium, and phosphorus (DVs above 90%). As a percentage of total fat, flaxseeds contain 54% omega-3 fatty acids (mostly ALA), 18% omega-9 fatty acids (oleic acid), and 6% omega-6 fatty acids (linoleic acid); the seeds contain 9% saturated fat, including 5% as palmitic acid. Flaxseed oil contains 53% 18:3 omega-3 fatty acids (mostly ALA) and 13% 18:2 omega-6 fatty acids. One study of research published between 1990 and 2008 showed that consuming flaxseed or its derivatives may reduce total and LDL-cholesterol in the blood, with greater benefits in women and those with high cholesterol. A meta-analysis has shown that consumption of more than 30 g of flaxseed daily for more than 12 weeks reduced body weight, body mass index (BMI), and waist circumference for persons with a BMI greater than 27. Another meta-analysis has shown that consumption of flaxseed for more than 12 weeks produced small reductions in systolic blood pressure and diastolic blood pressure. Flaxseed supplementation showed a small reduction in c-reactive protein (a marker of inflammation) only in persons with a BMI greater than 30. Flaxseed and its oil have repeatedly been demonstrated to be nontoxic and are generally recognized as safe for human consumption. Like many common foods, flax contains small amounts of cyanogenic glycoside, which is nontoxic when consumed in typical amounts, but may be toxic when consumed in large quantities as with staple foods such as cassava. Typical concentrations (for example, 0.48% in a sample of defatted dehusked flaxseed meal) can be removed by special processing. The soils most suitable for flax, besides the alluvial kind, are deep loams containing a large proportion of organic matter. Flax is often found growing just above the waterline in cranberry bogs. Heavy clays are unsuitable, as are soils of a gravelly or dry sandy nature. Farming flax requires few fertilizers or pesticides. Within eight weeks of sowing, the plant can reach 10–15 cm (3.9–5.9 in) in height and grows several centimeters per day under its optimal growth conditions, reaching 70–80 cm (28–31 in) within 50 days. In 2014, world production of flax (linseed) was 2.65 million tonnes, led by Canada with 33% of the global total. Other major producers were Kazakhstan, China, and Russia (table). Flax is harvested for fiber production after about 100 days, or a month after the plants flower and two weeks after the seed capsules form. The bases of the plants begin to turn yellow. If the plants are still green, the seed will not be useful, and the fiber will be underdeveloped. The fiber degrades once the plants turn brown. Flax grown for seed is allowed to mature until the seed capsules are yellow and just starting to split; it is then harvested in various ways. A combine harvester may either cut only the heads of the plants, or the whole plant. These are then dried to extract the seed. The amount of weeds in the straw affects its marketability, and this, coupled with market prices, determines whether the farmer chooses to harvest the flax straw. If the flax straw is not harvested, typically, it is burned, since the stalks are quite tough and decompose slowly (i.e., not in a single season). Formed into windrows from the harvesting process, the straw often clogs up tillage and planting equipment. Flax straw that is not of sufficient quality for fiber uses can be baled to build shelters for farm animals, or sold as biofuel, or removed from the field in the spring. Two ways are used to harvest flax fiber, one involving mechanized equipment (combines), and a second method, more manual and targeting maximum fiber length. Flax for fiber production is usually harvested by a specialized flax harvester. Usually built on the same machine base as a combine, but instead of the cutting head it has a flax puller. The flax plant turned over and is gripped by rubber belts roughly 20–25 cm (8-10") above ground, to avoid getting grasses and weeds in the flax. The rubber belts then pull the whole plant out of the ground with the roots so the whole length of the plant fiber can be used. The plants then pass over the machine and is placed on the field crosswise to the harvesters direction of travel. The plants are left in the field for field retting. The mature plant can also be cut with mowing equipment, similar to hay harvesting, and raked into windrows. When dried sufficiently, a combine then harvests the seeds similar to wheat or oat harvesting . The plant is pulled up with the roots (not cut), so as to increase the fiber length. After this, the flax is allowed to dry, the seeds are removed, and it is then retted. Dependent upon climatic conditions, characteristics of the sown flax and fields, the flax remains on the ground between two weeks and two months for retting. As a result of alternating rain and the sun, an enzymatic action degrades the pectins which bind fibers to the straw. The farmers turn over the straw during retting to evenly rett the stalks. When the straw is retted and sufficiently dry, it is rolled up. It is then stored by farmers before extracting the fibers. Threshing is the process of removing the seeds from the rest of the plant. Separating the usable flax fibers from other components requires pulling the stems through a hackle and/or beating the plants to break them. Flax processing is divided into two parts: the first part is generally done by the farmer, to bring the flax fiber into a fit state for general or common purposes. This can be performed by three machines: one for threshing out the seed, one for breaking and separating the straw (stem) from the fiber, and one for further separating the broken straw and matter from the fiber. The second part of the process brings the flax into a state for the very finest purposes, such as lace, cambric, damask, and very fine linen. This second part is performed by a refining machine. Before the flax fibers can be spun into linen, they must be separated from the rest of the stalk. The first step in this process is retting, which is the process of rotting away the inner stalk, leaving the outer parts intact. At this point, straw, or coarse outer stem (cortex and epidermis), is still remaining. 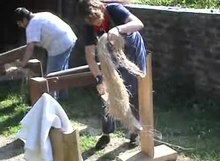 To remove this, the flax is "broken", the straw is broken up into small, short bits, while the actual fiber is left unharmed. Scutching scrapes the outer straw from the fiber. The stems are then pulled through "hackles", which act like combs to remove the straw and some shorter fibers out of the long fiber. Several methods are used for retting flax. It can be retted in a pond, stream, field, or tank. When the retting is complete, the bundles of flax feel soft and slimy, and quite a few fibers are standing out from the stalks. When wrapped around a finger, the inner woody part springs away from the fibers. Pond retting is the fastest. It consists of placing the flax in a pool of water which will not evaporate. It generally takes place in a shallow pool which will warm up dramatically in the sun; the process may take from a few days to a few weeks. Pond-retted flax is traditionally considered of lower quality, possibly because the product can become dirty, and is easily over-retted, damaging the fiber. This form of retting also produces quite an odor. Stream retting is similar to pool retting, but the flax is submerged in bundles in a stream or river. This generally takes two or three weeks longer than pond retting, but the end product is less likely to be dirty, does not smell as bad, and because the water is cooler, is less likely to be over-retted. Both pond and stream retting were traditionally used less because they pollute the waters used for the process. In field retting, the flax is laid out in a large field, and dew is allowed to collect on it. This process normally takes a month or more, but is generally considered to provide the highest quality flax fibers, and it produces the least pollution. Retting can also be done in a plastic trash can or any type of water-tight container of wood, concrete, earthenware, or plastic. Metal containers will not work, as an acid is produced when retting, and it would corrode the metal. If the water temperature is kept at 80 °F (27 °C), the retting process under these conditions takes 4 or 5 days. If the water is any colder, it takes longer. Scum collects at the top, and an odor is given off the same as in pond retting. 'Enzymatic' retting of flax has been researched as a technique to engineer fibers with specific properties. Dressing the flax is the process of removing the straw from the fibers. Dressing consists of three steps: breaking, scutching, and heckling. The breaking breaks up the straw. Some of the straw is scraped from the fibers in the scutching process, and finally, the fiber is pulled through heckles to remove the last bits of straw. Breaking breaks up the straw into short segments. Scutching removes some of the straw from the fiber. Heckling is pulling the fiber through various sizes of heckling combs or heckles. A heckle is a bed of "nails"—sharp, long-tapered, tempered, polished steel pins driven into wooden blocks at regular spacing. In September 2009, Canadian flax exports reportedly had been contaminated by a deregistered genetically modified cultivar called 'Triffid' that had food and feed safety approval in Canada and the U.S., however, Canadian growers and the Flax Council of Canada raised concerns about the marketability of this cultivar in Europe where a zero tolerance policy exists regarding unapproved genetically modified organisms. Subsequently, deregistered in 2010 and never grown commercially in Canada or the U.S., 'Triffid' stores were destroyed, but future exports and further tests at the University of Saskatchewan proved that 'Triffid' persisted among flax crops, possibly affecting future crops. Canadian flaxseed cultivars were reconstituted with 'Triffid'-free seed used to plant the 2014 crop. Laboratories are certified to test for the presence of 'Triffid' at a level of one seed in 10,000. Flax is the emblem of Northern Ireland and displayed by the Northern Ireland Assembly. In a coronet, it appeared on the reverse of the British one-pound coin to represent Northern Ireland on coins minted in 1986, 1991, and 2014. Flax also represents Northern Ireland on the badge of the Supreme Court of the United Kingdom and on various logos associated with it. Common flax is the national flower of Belarus. In early versions of the Sleeping Beauty tale, such as "Sun, Moon, and Talia" by Giambattista Basile, the princess pricks her finger, not on a spindle, but on a sliver of flax, which later is sucked out by her children conceived as she sleeps. ^ "The Plant List: A Working List of All Plant Species". Retrieved 2 October 2014. ^ "Linum usitatissimum". Germplasm Resources Information Network (GRIN). Agricultural Research Service (ARS), United States Department of Agriculture (USDA). Retrieved 2 October 2014. ^ Allaby, R.; Peterson, G.; Merriwether, D.; Fu, Y.-B. (2005). "Evidence of the domestication history of flax (Linum usitatissimum L.) from genetic diversity of the sad2 locus". Theoretical and Applied Genetics. 112 (1): 58–65. doi:10.1007/s00122-005-0103-3. PMID 16215731. ^ Quanru Liu; Lihua Zhou. "Linum". Flora of China. 11. Archived from the original on 5 April 2015. Retrieved 2 October 2014. ^ "These Vintage Threads Are 30,000 Years Old". NPR. Archived from the original on 2010-12-04. Retrieved 2010-11-13. ^ a b Fu, Y.-B. (2011). "Genetic evidence for early flax domestication with capsular dehiscence". Genetic Resources and Crop Evolution. 58 (8): 1119–1128. doi:10.1007/s10722-010-9650-9. ^ McHughen, A (1990). 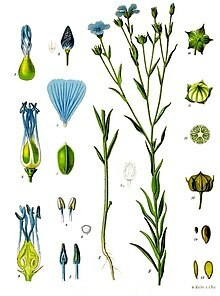 "Flax (Linum usitatissimum L.): In Vitro Studies". Biotechnology in Agriculture and Forestry. 10: 502–514. doi:10.1007/978-3-642-74448-8_24. ISBN 978-3-642-74450-1. ^ Grant, Amanda (2007-03-06). "Superfoods". The Guardian. London. Archived from the original on 2016-09-21. ^ "Pigments through the Ages - Renaissance and Baroque (1400-1600)". Archived from the original on 2012-07-19. ^ "Flax nutrition profile". Archived from the original on 2009-07-23. Retrieved 2008-05-08. ^ Mayo Clinic (2006-05-01). "Drugs and Supplements: Flaxseed and flaxseed oil (Linum usitatissimum)". Archived from the original on 2007-07-14. Retrieved 2007-07-02. ^ Alpers, Linda; Sawyer-Morse, Mary K. (August 1996). "Eating Quality of Banana Nut Muffins and Oatmeal Cookies Made With Ground Flaxseed". Journal of the American Dietetic Association. 96 (8): 794–796. doi:10.1016/S0002-8223(96)00219-2. PMID 8683012. ^ Malcolmson, L.J. (April 2006). "Storage stability of milled flaxseed". Journal of the American Oil Chemists' Society. 77 (3): 235–238. doi:10.1007/s11746-000-0038-0. Retrieved 2008-04-24. ^ Chen, Z-Y (1994). "Oxidative stability of flaxseed lipids during baking". Journal of the American Oil Chemists' Society. 71 (6): 629–632. doi:10.1007/BF02540591. ^ Kaza-Papageorgiou, Konstantina (2015-11-30). The Ancient Astiki Odos and the Metro beneath Vouliagmenis Avenue. Athens, Greece: Kapon Editions. ISBN 978-9606878947. ^ Wardey, A. J. (1967). The Linen Trade: Ancient and Modern. Routledge. p. 752. ISBN 978-0-7146-1114-3. ^ a b "Nutrition facts for 100 g of flaxseeds". Conde Nast for USDA National Nutrient Database, version SR-21. 2015. Archived from the original on 2010-12-05. ^ a b "Full Report (All Nutrients): 12220, Seeds, flaxseed per 100 g". USDA National Nutrient Database version SR-27. 2015. Archived from the original on 2014-09-20. ^ a b Goyal A, Sharma V, Upadhyay N, Gill S, Sihag M (2014). "Flax and flaxseed oil: an ancient medicine & modern functional food". Journal of Food Science and Technology. 51 (9): 1622–1653. doi:10.1007/s13197-013-1247-9. PMC 4152533. PMID 25190822. ^ Pan, An; Yu, Danxia; Demark-Wahnefried, Wendy; Franco, Oscar H.; Lin, Xu (2009). "Meta-analysis of the effects of flaxseed interventions on blood lipids". The American Journal of Clinical Nutrition. 90 (2): 288–297. doi:10.3945/ajcn.2009.27469. ISSN 0002-9165. PMC 3361740. PMID 19515737. Archived from the original on 2016-08-05. ^ Mohammadi-Sartang M, Mazloom Z, Raeisi-Dehkordi H, Barati-Boldaji R, Bellissimo N, Totosy de Zepetnek JO (2017). "The effect of flaxseed supplementation on body weight and body composition: a systematic review and meta-analysis of 45 randomized placebo-controlled trials". Obesity Reviews. 18 (9): 1096–1107. doi:10.1111/obr.12550. PMID 28635182. Archived (PDF) from the original on 2017-07-29. ^ Khalesi S, Irwin C, Schubert M (2015). "Flaxseed consumption may reduce blood pressure: a systematic review and meta-analysis of controlled trials". Journal of Nutrition. 145 (4): 758–765. doi:10.3945/jn.114.205302. PMID 25740909. Archived from the original on 2017-03-09. ^ Ren GY, Chen CY, Chen GC, Chen WG, Pan A, Pan CW, Zhang YH, Qin LQ, Chen LH (2016). "Effect of Flaxseed Intervention on Inflammatory Marker C-Reactive Protein: A Systematic Review and Meta-Analysis of Randomized Controlled Trials". Nutrients. 8 (3): 136. doi:10.3390/nu8030136. PMC 4808865. PMID 26959052. ^ Cheeseman MA (24 August 2009). "GRAS Petition by Flax Canada, Agency Response Letter GRAS Notice No. GRN 000280". U.S. Food and Drug Administration. Archived from the original on 17 June 2015. Retrieved 1 June 2015. ^ Banea-Mayambu, JP; Tylleskar, T; Gitebo, N; Matadi, N; Gebre-Medhin, M; Rosling, H (1997). "Geographical and seasonal association between linamarin and cyanide exposure from cassava and the upper motor neurone disease konzo in former Zaire". Trop Med Int Health. 2 (12): 1143–51. doi:10.1046/j.1365-3156.1997.d01-215.x. PMID 9438470. ^ "Grow and Harvest Flax - Materials Matter 2016". Climate CoLab. Retrieved 2019-01-25. ^ a b "Flax (linseed) production in 2014; Crops/Regions/World List/Production Quantity (from pick lists)". UN Food and Agriculture Organization, Statistics Division (FAOSTAT). 2017. Archived from the original on 11 May 2017. Retrieved 21 February 2017. ^ Akin Dodd, Foulk (2008). "Pectinolytic enzymes and retting". BioResources. 3 (1): 155–169. ^ Akin Dodd, Foulk (2001). "Processing techniques for improving enzyme-retting of flax". Industrial Crops and Products. 13 (3): 239–248. doi:10.1016/s0926-6690(00)00081-9. ^ a b "Flax growers try to flush Triffid from system". The Western Producer. 11 January 2013. Archived from the original on 17 February 2016. Retrieved 11 January 2016. ^ a b "Sampling and Testing Protocol for Canadian Flaxseed Exported to the European Union" (PDF). Canadian Grain Commission. 28 April 2014. Archived (PDF) from the original on 14 October 2015. Retrieved 11 January 2016. ^ "Canada moves to revive flax exports after GMO flap". Reuters. 2010-01-08. Archived from the original on 2013-05-09. Retrieved 2012-11-11. ^ a b "Triffid seed threatens flax industry". CBC News. 20 January 2010. Archived from the original on 1 February 2016. Retrieved 11 January 2016. 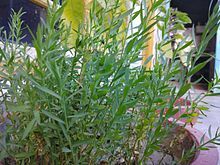 Wikimedia Commons has media related to Flax. Look up flax or flaxen in Wiktionary, the free dictionary. This page was last edited on 15 March 2019, at 07:47 (UTC).